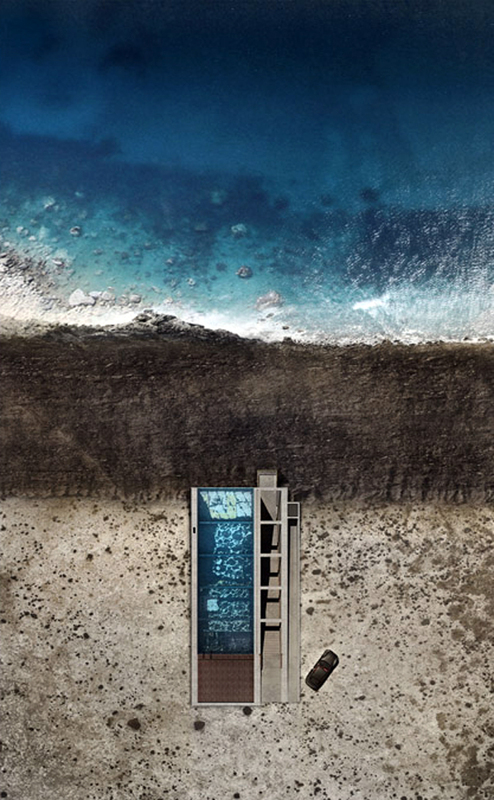 Seemingly an excerpt from a sci-fi novel, Casa Brutale by OPA (Open Platform for Architecture) is another groundbreaking instance of poetically blending the built and its backdrop. 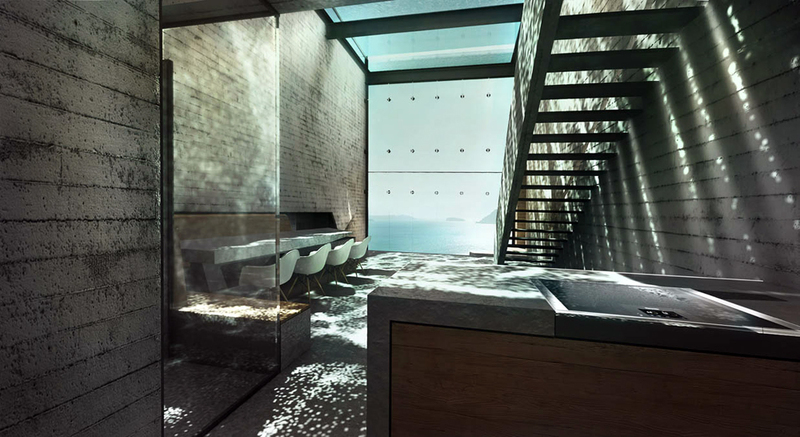 OPA is a Greek architecture firm founded by partners Laertis Antonios Vassiliou and Pantelis Kampouropoulos. 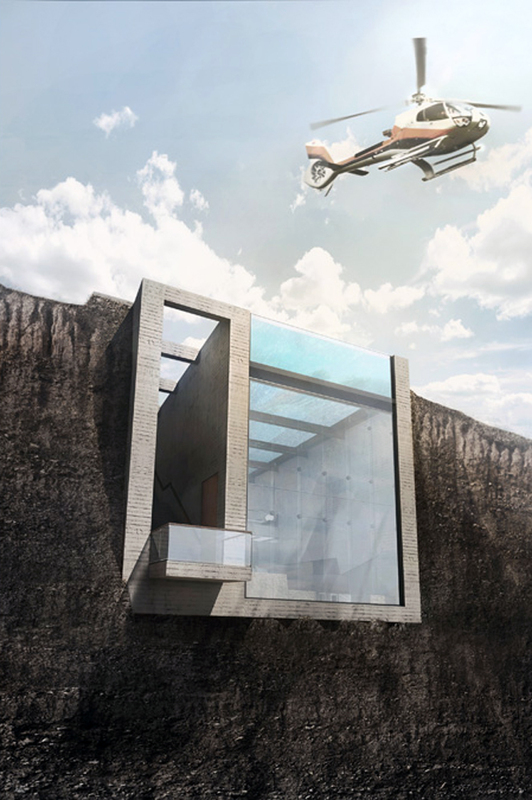 The landscape of Rhodes inspired the architects to design a villa that was set into the cliff rather than on top of it. 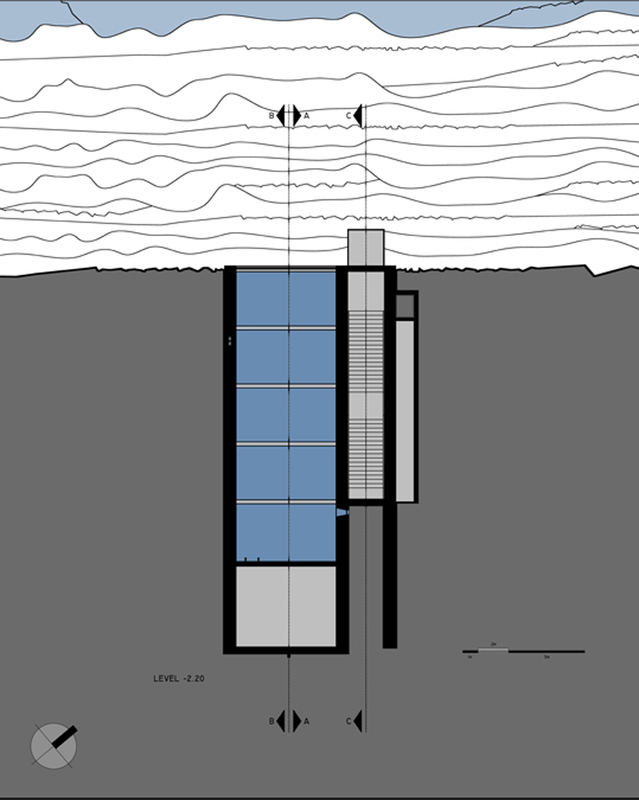 Intended as an inverted nod to the infamous ‘Casa Malaparte’, the blend of wood, glass, and concrete converges with the surrounding earth exposing only one facade from the cliff side and no volume extruding from the datum. 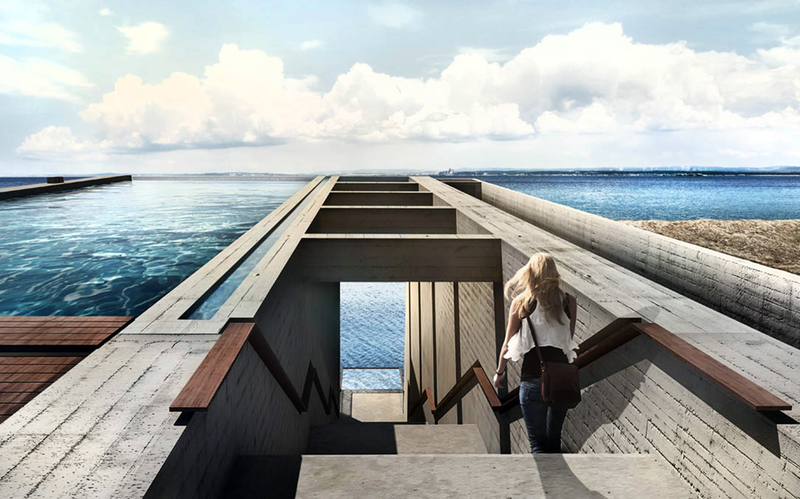 Geometrically it’s a cuboid embedded into the coastal cliff, with only two surfaces exposed to sky and the sea. 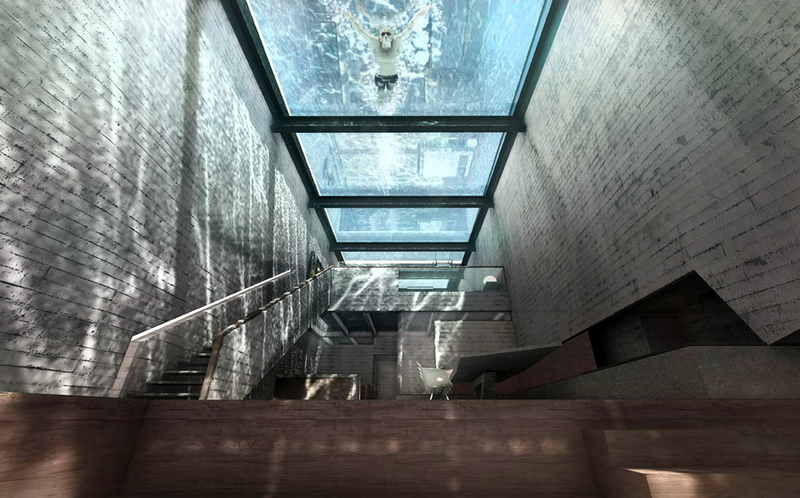 The roof made out of reinforced glass, set between the solid grey walls to smoothen their hardness is actually a swimming pool. Its glazed bottom floods abundant natural light, creating a dynamic ambience by caressing the concrete with surreal refractive patterns. 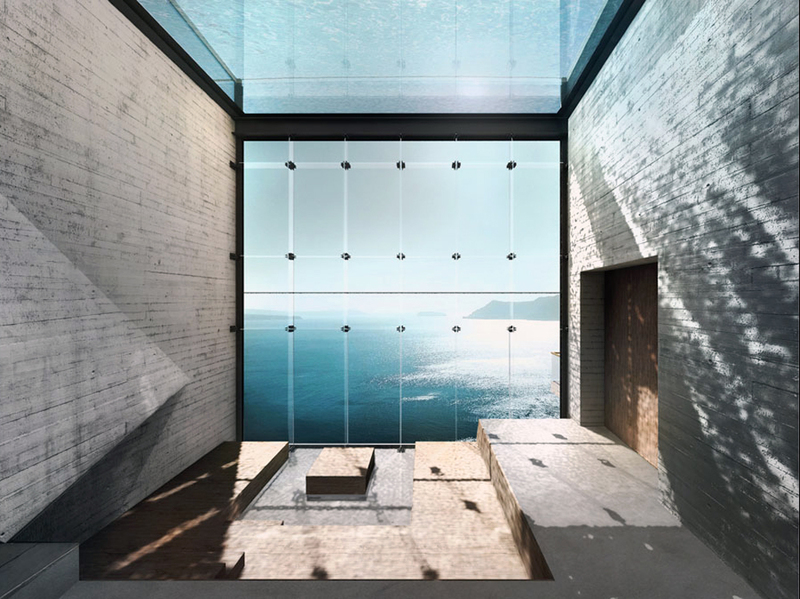 The dominant glass facade frames and extracts the beauty of the Aegean. 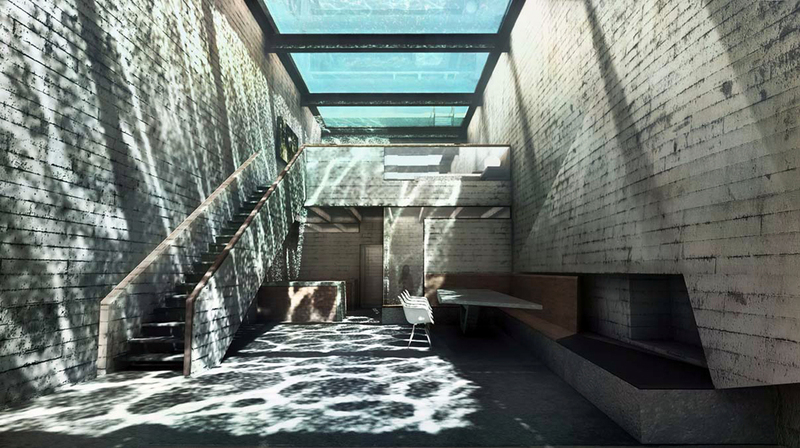 Light penetrates the transparent and translucent surfaces bringing Casa Brutale to life. Small details of steel sputtered in black and aged wood in shades of brown/red complete the composition. Bare concrete, or Beton Brut, is the finishing technique that coined the style ‘Brutalism’ and named it ‘Casa Brutale’. Raw, unpretentious, monolithic, marked by the wooden planks used to mold the casting. This particular concept is surely intended for the Mediterranean. 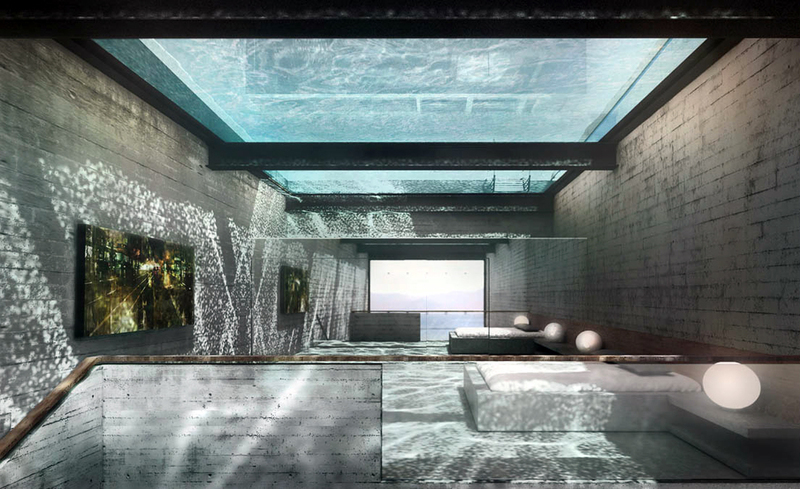 The sunken built mass benefits from a perfect homeostatic mechanism with thermal insulation from the surrounding ground, and evaporative cooling by the swimming pool. After descending 50 steps, under the shadows of potent concrete beams, one reaches the entrance of the house which extends into a balcony cantilevered over the Aegean. Parallel to this lies an alternate access, a linear ramp leading to the elevator. The tall, rotating door of aged wood opens to a breathtaking sea view, through the glass facade. The interiors are bare, pure and simple; minimalism at its best. A concrete cast dining table is combined with concrete benches, clad with warm wood. Dynamic curves niche out the sculpturesque fireplace. Behind the dining table, the guest room is formed under an old-fashioned Zoellner slab with a glass corner. Remaining area forms a little passage to the utility rooms. An inner staircase runs along a handrail pierced into the wall, which bleeds a streak of light from the external ramp. The flight consists of thin, steel treads to retain visual continuity from the kitchen to the glass facade. The staircase lands at the mezzanine, where the master bedroom responds to the cerulean Aegean. The bed is cast of concrete with a wooden finish, while the walls are covered with mirror to enhance the play of light. Casa Brutale redefines the harmonious coexistence of human and nature in homage to pure Brutalism. This innovation integrates bygone architectural jargons such as ambience and materiality. Now that’s thinking out of box.